During this time of increased focus on care redesign and patient affordability at BWH and throughout the country, generous BWH donors have provided medical residents with the means to pursue and test innovative projects that produce cost savings and streamline care. The project is embedded in a large hospital-wide program to improve inter-professional teamwork by ensuring that health care teams and the patients under their care are co-localized to a single unit, as opposed to spread out throughout the hospital. The committee also recognized that the savings and improvements from this project will become models for care and thereby benefit various departments within the hospital, not only the Department of Medicine. 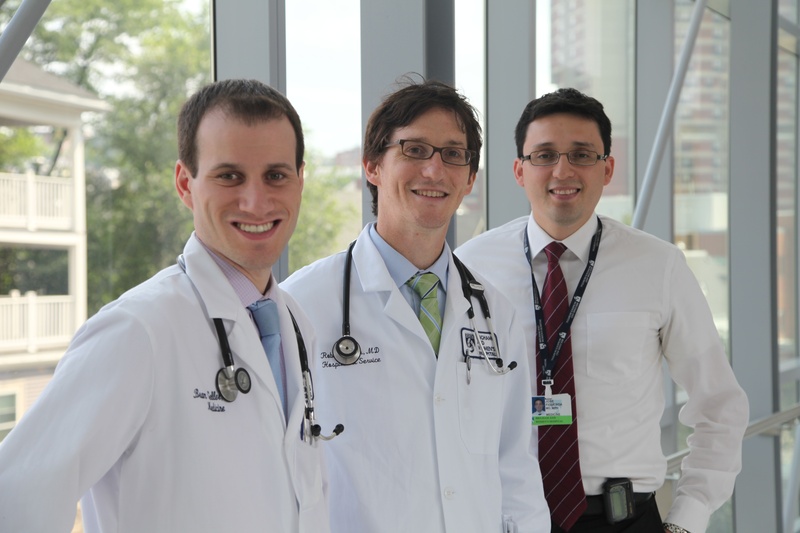 Figueroa and Geller, who were selected for the award from among six nominees, are working closely on their project with fellow residents Vinod Nambudiri, MD, MBA, Corrine Kliment, MD, PhD, and Judson Englert, MD, PhD. Their faculty representative is Robert Boxer, MD, PhD, associate director for the BWH Hospitalist Service and leader of a care redesign initiative on the General Medicine Service, within which this project is embedded. “Having teams focus on discharging appropriate patients earlier in the day allows for beds to open in the hospital earlier and, in turn, makes possible the localization of a team’s patients and the resulting improvements in communication and safety,” said Boxer. The Rappaport Foundation has supported BWH for more than two decades. In addition to the new award in clinical innovation, the Rappaports also established the Rappaport Scholars Fund at Harvard Medical School and BWH. For 20 years, the fund has assisted bright young minds training in the area of fundamental biological research on Alzheimer’s disease. This new award highlights the foundation’s and the hospital’s shared interest in innovation, cost-containment and efficiency.